Step 1:Mix butter and sugar together. Now add milk with it and blend it well. Step 2:Whisk well after adding refined floor, coconut crush, baking powder and raisins. Now make small balls from this preparation. Sprinkle murmura on it. Step 3: Now bake it on the 150 degree C preheated oven for 8-10 minutes. Serve it cold. This easy sweet snacks recipe makes your afternoon treat special. Goodness of dry fruits like raisins and crispy murmure flavor can add extra zing to your taste buds. 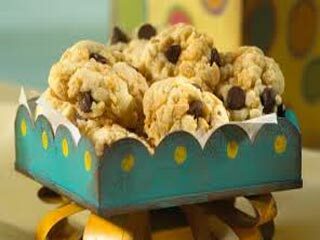 Indulge in the sweet crispy taste of this easy recipe and surprise your loved ones.